A slightly different tone of post for me but when it comes to Lymphoedema there can be moments of sheer frustration and a lot of the time things are not very straightforward – so I thought I’d do a wee bit on that. 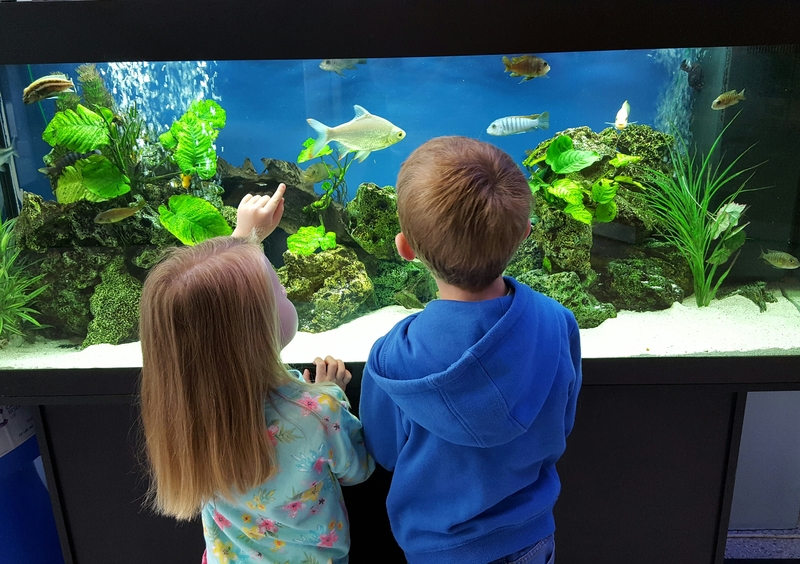 (I have used the fish tank photo on this post for a nice calming effect!). For a start we still don’t know how or why Lucia has the condition, why she has good days and not so good days, why her swelling can fluctuate so much or even how her legs and feet really feel to her. I think that is one of the toughest things for me – not having a clue how it physically feels for her. However, over her four little years we have learned how to try and navigate these moments as best we can and give her the best care we can, including the moments when we meet medical professionals who don’t have much of a clue about the condition. The first time was when a paediatrician sent us home when Lucia was only a few months old telling us it was ‘just’ Lymphoedema and no advice on what we should do because he didn’t know. Then, at one of Lucia’s appointments for her vaccinations I had to tell the doctor not to do the injections in her legs and explained why. However, the doctor tried to insist that it would be absolutely fine – to which I disagreed and firmly stated that no needles would be put into my baby’s legs and that was that. She got them in her arms instead. Lucia recently had her four year check-up where I was asked, ‘does Lucia STILL have…’. She found it difficult to say ‘Lymphoedema’ as she’d probably never come across it before, so I helped her out with the word and said yes, it is a life long condition and that we see a specialist every month. My current frustration though is compression garments. We have been working pretty constantly with Lucia’s therapist to try and get things sorted (I think we are her worst nightmare at the moment!) but we just haven’t got there yet. Someone commented on a previous blog post that it took them 15 years to get the right garments and the right fit and I am really hoping that won’t be the same for us! Lucia is currently wearing garments that are about 9 months old and pretty much useless. They are full of holes that have been repaired so many times I have lost count and new holes are appearing almost everyday through wear and tear. Bearing in mind she usually gets new garments approximately every three to four months you can understand where we are. The company that we have used up until now just haven’t been making suitable garments for us since January of this year. We aren’t sure exactly what the problem is but not one pair we have received since the start of the year has been wearable – with some even pushing the fluid down and making her swelling worse. We are now trying a couple of other companies and hoping something will meet her needs in terms of fit, comfort and style. And this needs to happen sooner rather than later as she desperately needs new garments and I want them sorted for her starting big school in September. We also need them sorted because her most affected foot, ankle and leg (her right) has been fluctuating quite a bit in terms of swelling lately. There will be days when her swelling goes up for no apparent reason and days when it goes down – but we have no idea why. It particularly affects her little foot which can feel so thick and heavy at times, her converse can be hard to get on and stay on and her little toes also hold so much fluid. Her ankle also gets very puffy and it can be difficult to try and get this fluid on the move again. So our compression hunt is continuing and to add to this we are also now thinking of looking into toe caps as well – which quite frankly scare the life out of me. When we first started looking into compression I remember coming across a photo of a person wearing thick, ribbed compression complete with toe caps and I cried at the thought of my baby girl having to wear them. They also looked so uncomfortable and I can’t imagine Lucia even allowing us to put them on – and she can be one very stubborn girl. But we have to think of the condition and how we can manage it to the best of our ability. And compression is such a vital component of that management so we need to just find what works for her. So while we wait to discover some new compression we are occasionally using a type of punched kinesio tape on her foot and ankle, under her current garments which does work quite well – when she lets us put it on. She absolutely hates getting it off so we don’t get to use it as much as we would like (see the stubborn comment a few lines above!). I feel like I’ve been a bit waffly in this post but my main point is the frustration that comes with this condition in a variety of forms and how nothing is straight forward and easy. But, as always we will get to where we need to be and will keep going until we do. 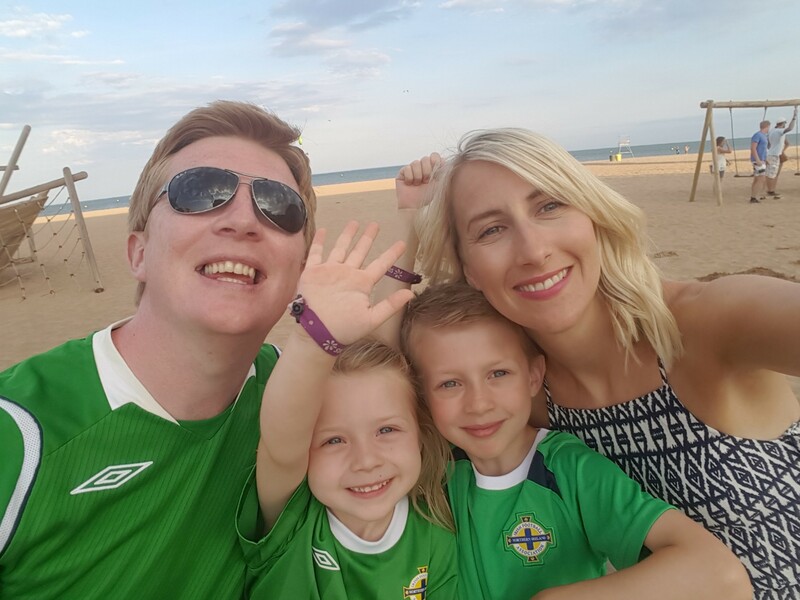 Last weekend we returned from a fantastic family holiday to France and it was a wonderfully chilled out few weeks where we spent time enjoying the sun, the pool, the food, the area, some precious time together and, of course, the football! We headed off with a few other members of our family and a friend as the boys in the group had got tickets to Northern Ireland’s qualifying matches in Euro 2016. Our little country got the last 16 which was a fantastic feat and as you can see from the cover pic we were very proud! We all came home feeling well rested as we really enjoyed having nothing to do except put sun cream on, play in the pool, decide when to have lunch and whether we would barbecue or head out for dinner…no routine, no timetables, no deadlines. Just chill time (and football time!). The lead up to the holiday was a bit manic and stressful as there had been a lot going on with day-to-day life, including the continued nightmare with Lucia’s compression garments. Without getting into it all we are still having difficulty getting new compression tights. We had hoped to have new garments before the holiday but things didn’t work out. So the day before we left, as I sat on the floor in a mixture of panic and helplessness, we had to figure something out. And our wonderful therapist came to the rescue. She came to our house to give us a crash course in a variety of different techniques we could use should Lucia’s Lymphoedema flare up when we were in France, complete with necessary supplies. She showed us how to bandage her toes and foot, how to continue it up her legs, how to use kinesio tape and some multi-layer bandaging. She also sent us you tube videos showing us what to do, printed out diagrams and let me video her actually carrying out the wrapping on Lucia so we could copy it. Lucia has been wearing the same pair of compression garments for around eight months now (there’s barely any compression left in them and I have sewed them in a least 12 places on numerous occasions) but they had to come with us. We also found another old pair made at the same time that still fitted ok, but also with holes which I patched up – they went with us too. As did the Physiotouch machine of course, all of the extra supplies and our massive first aid kit. 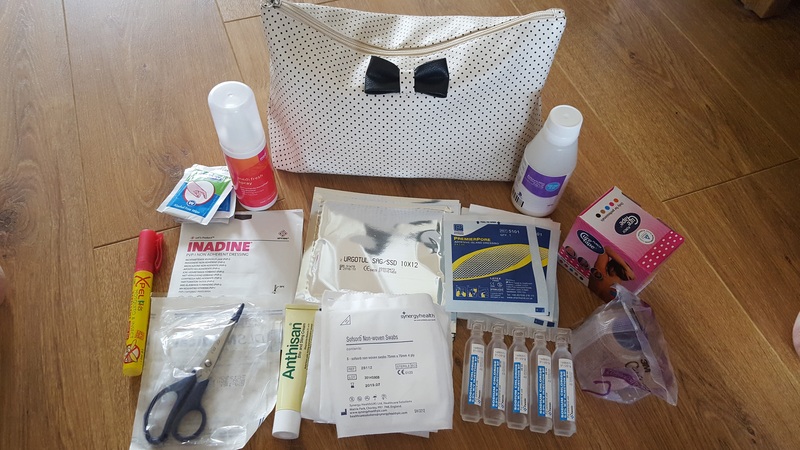 (The pic below is just a very small sample of our first aid kit!) At least half of a suitcase was filled with Lymphoedema stuff! So we headed on our way at 3am with bulging suitcases and the hope that all would be ok. And it was. France is only a two hour flight but we still made sure Lucia got up and had little walks down the aisle as well as drinking plenty of fluids as we flew. Our caravan site was then only an hours drive from the airport and when we got into the hire car we took Lucia out of her compression for a bit of a breather as she had been in them since the middle of the night. Our normal routine went out the window and holiday mode kicked in pretty quickly. Our mornings were lovely and lazy but we usually tried to get Lucia into her garments for a few hours while we were enjoying croissants, pain au chocolats and playing games in the caravan. We would then get ready for the pool so off came the garments and on went the swimming costume. 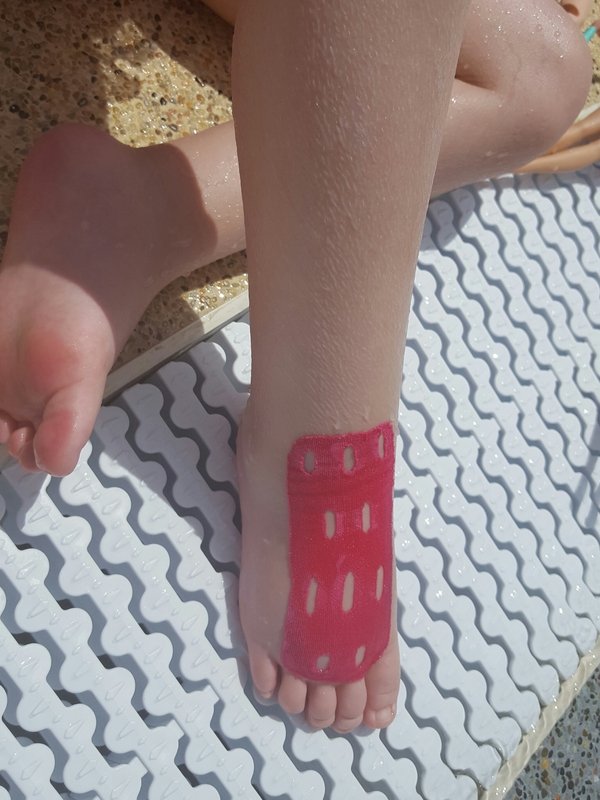 We also put a type of Kinesio tape with holes punched in it called Cure Tape on Lucia’s foot and ankle and it worked wonders when she was out of her tights. (We used to use this when she was just a toddler, pre compression.) Basically it lifts the skin a little to help the fluid flow better and it definitely helped to keep the swelling down in her foot and ankle where it would tend to pool when she has no tights or shoes on. The caravan site had a brand new swimming complex and both Max and Lucia absolutely loved it. They played for hours in the different pools before getting wrapped up in towels and having a snack on the sun lounger. Swimming is one of the best forms of exercise for Lymphoedema as the water acts as natural compression, so having Lucia spend a few hours a day kicking and splashing like a mermaid was so beneficial for the condition. We could really see the positive effect it had on her, particularly her little leg. After we had spent a few hours at the swimming pool we would come back to the caravan and shower the kids to get all the chlorine off before deeply moisturising Lucia’s legs and feet. We would then usually put her back into her tights for the evening, particularly if we were heading out for dinner or for a play in the park on site. We also brought ‘the machine’ – otherwise known as the Physiotouch – with us too. You can read about it in more detail here. It’s a great size to travel with so we carried it as hand luggage and we took time out most days to have a session since Lucia was having a lot more compression free time than normal. It kept the fluid moving and the swelling down in combination with the swimming, kinesio, compression and the extra elevation during rest periods. 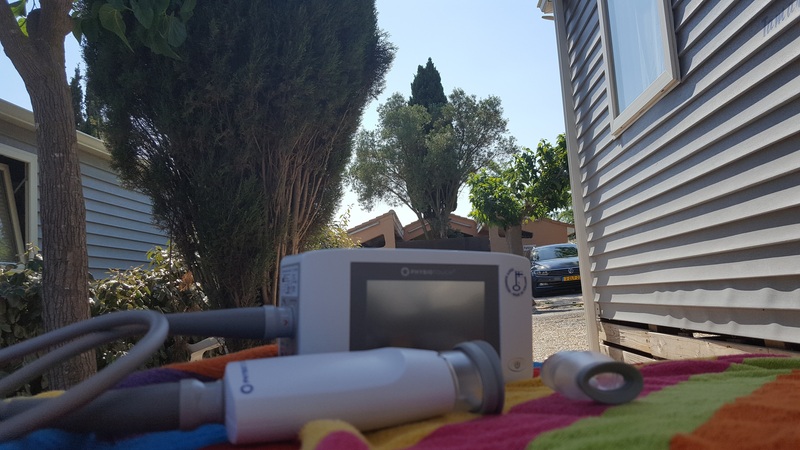 As an added bonus we could charge the Physiotouch up and use it outside on the decking meaning we could still enjoy the sunshine while carrying out her therapy! We had one evening where the fluid gathered in a ball on the inside of her right ankle – we hadn’t done anything different that day so have no idea why – but it was really quite bad. Enter the Physiotouch which really helped to break this fluid down and get it moving again. We also had a few other instances where her little toes were more swollen than normal so we would carry out a bit of manual work to try and move it, though it is a nightmare getting fluid to move from toes. A few nights we wanted to bandage her foot but Lucia wasn’t keen and we didn’t want to push it. Everything was going so well until one morning in our second week Lucia complained of having a sore foot and not being able to walk properly. So I had a look and found she had a splinter in the heel of her most affected foot. It was very red, angry and inflamed all around it and I was immediately on edge – especially because Daryn was already away to one of the matches. I got our trusty Savlon antiseptic cream out and treated the area, as I knew we couldn’t start poking at it in case we aggravated the infection. Thankfully my sister, who was also on holidays with us, took a drive straight to the pharmacy to try and get some magnesium sulphate to draw it out, but to no avail. Instead, we went down the old fashioned route and she made up a bread poultice. It took a bit of persuading but Lucia finally allowed us to put it on her foot for a few hours that morning and the difference it made in that short space of time was unreal. The redness and swelling had calmed making a it a little easier for her to walk on. We then put the poultice on again at bedtime (again it took a bit of coaxing) and she kept it on all night – and by morning the splinter was out! Thankfully no infection took hold and everything calmed down. Another learning curve and big thanks to my lovely sister! All in all we had such a fantastic time. 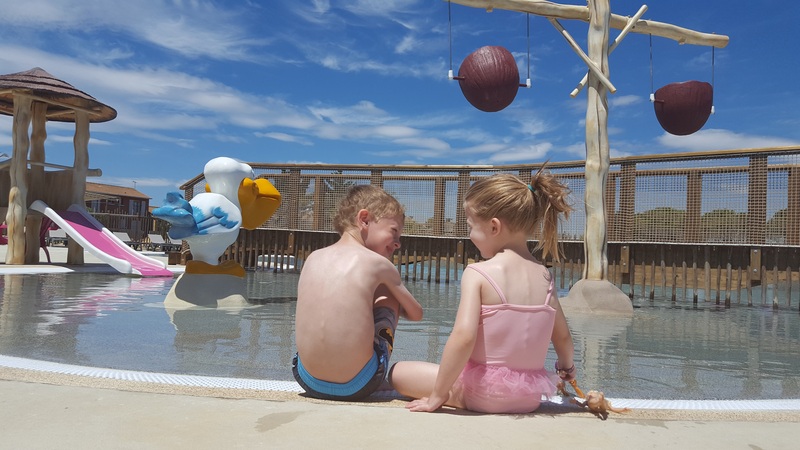 Max and Lucia loved the adventure of flying on a plane, living in a caravan, sharing a room, playing in the pool, staying up late and we also did a few day trips including a safari park, zoo, dinosaur park and beach. We have always said we would never let Lucia’s Lymphoedema hold us back and we really don’t. We just have to think ahead, consider our options, make wise choices that will fit our needs and ensure we are well prepared for every eventuality. Our experience over the years keeps adding to our confidence and we are continuously learning new ways of managing things. And loving living our lives at the same time.